"Kevin, would you like to smell chocolaty?" It's a short walk from baked goods (I like scents with bread and cake notes), spices, and sweet "fancy" dessert aromas of violet and rose to — chocolate bars, fudge and icing. I took the necessary steps by buying a sample of Chocolate Man from Arizona-based Dame Perfumery last summer. I finally tried Chocolate Man this week, three months later, and am eating my anti-chocolate-perfume words. I can't keep my nose from my perfume-doused arms as I dream of dense brownies, a bowl of darkest chocolate (warm!) frosting or plump, creamy truffles. Chocolate Man goes on smelling of hot (temperature) chocolate; if you cook, you'll recognize the aroma of tempering or baking chocolate (the "chocolate" is super-dark, aromatic, not too sweet). Chocolate Man retains this delicious gourmand note throughout its development. I also detect notes that smell of vanilla bean, wood — or woody patchouli — and a phase that mimics the scent of burnt sugar. My partner, who sniffed my wrist hours after I applied Chocolate Man, said it reminded him of the cotton candy sold at carnivals, where a deep aroma of hot sugar fills the air around the candy-making machines. In the extreme dry down, Chocolate Man, appropriately, smells of powdered, slightly bitter, cocoa. If I had smelled Chocolate Man "blind" I may have thought it was a Thierry Mugler creation, maybe A*Men Pure Chocolate. It also brought to mind a few other oriental/gourmands: Chanel Coromandel, Arquiste Anima Dulcis and *a much less challenging* Serge Lutens Borneo 1834. Chocolate Man has good lasting power and sillage and it smells better than perfumes I've worn recently that cost $100 more than it does. At $65 for 100 ml, Chocolate Man's a bargain (or as we say in Perfumeland, it's basically "free"). Dame Perfumery Chocolate Man can be found at Indigo Perfumery or Dame Perfumery in the US, or at Etiket in Canada. 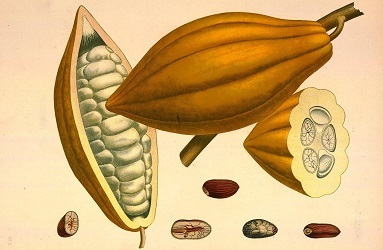 Note: top image of Theobroma cacao [altered] from Köhler's Medizinal-Pflanzen in naturgetreuen Abbildungen mit kurz erläuterndem, via Wikimedia Commons. Happy to see a review on NST for one of my favorite houses! I have a decant of Chocolate Man and although the initial blast registers as “odd” to my nose the drydown is absolutely amazing!!!! And, yes, the prices on the 100ml are a steal! Choco, do tell me others in the line you think I shoukd try…. Oh boy…you are asking the wrong person because I love em all! I have tried every scent except for the last four or five new ones from his soliflore collection…right now I have full bottles of Dark Horse, Bergamot, Jasmine & Labdanum and Black Flower Mexican Vanilla…my parents have about eight full bottles that I had gifted to them for various occasions….I will tell you that Citrus Man smells amazing on my mother and I happen to love Herb Man as well as Leather Man (and I am a woman! )….the Musk Man is nice too especially for layering!!!! all of the fragrances are easy to wear, pretty, non-offensive and highly affordable so you can’t go wrong…. and don’t be afraid to try any from the womens collection…they are definitely unisex! I’ve only tried the perfume oils because of shipping but I second Chocolatemarzipan on Dark Horse, Black Flower Mexican Vanilla. I’m a bit less keen on New Musk and the soliflore gardenia – but that’s just personal taste, not a reflection on the scent. Sounds like it almost needs a list of calories rather than notes. I like the sound of this even though chocolate is hard to wear (sometimes). The only chocolate scent I own is California Chocolate which has just enough dustiness (like cacao) to balance the orange (jaffa). I had my doubts about wearing it but I see my bottle is half empty so I must be greedier than I thought. Thanks for the great review…very tempted. Kanuka, eating chocolate and wearing this at the same time could induce shock I bet. This sounds like a 100 mL sample would be appropriate. Thanks for the review, Kevin! Sounds delicious and something I need to try soon. You really are a genius, you know!